1 dl (½ cup) strawberry jam without seeds. The above video is for an unbaked pie base, but the general process until the actual baking is the same. Blend biscuits and butter together in a food processor. Or crumbs biscuits with your fingers and mix the butter. Bake approximately 10 minutes at 150º C (300º F). Mix everything together in a bowl and mix with a hand mixer, spoon or a meat-hook on a kitchen appliance. Stir as little as possible. Too many air bubbles and the cake rises up when it bakes. Which is not the intention. Pour it into the spring form on top of the baked base. Spread the jam over the cake in droppings. Run a knife through so it becomes marbled. Bake for about 1- 1½ hours at 150º C (300º F). Until the internal temperature is 70ºC - 72ºC (160ºF). Use a probing meat thermometer the first few times. It shall wobble slightly in the middle but not spill. If you stick a knife into the middle of it, the cake should not stick to it when you pull it out. The baking part is the most difficult to get right. Because the cake is so fluid, it is a very difficult cake to get right if you do not know the technique. Even the difference in the size of the springform is of important. The cake is best the next day. 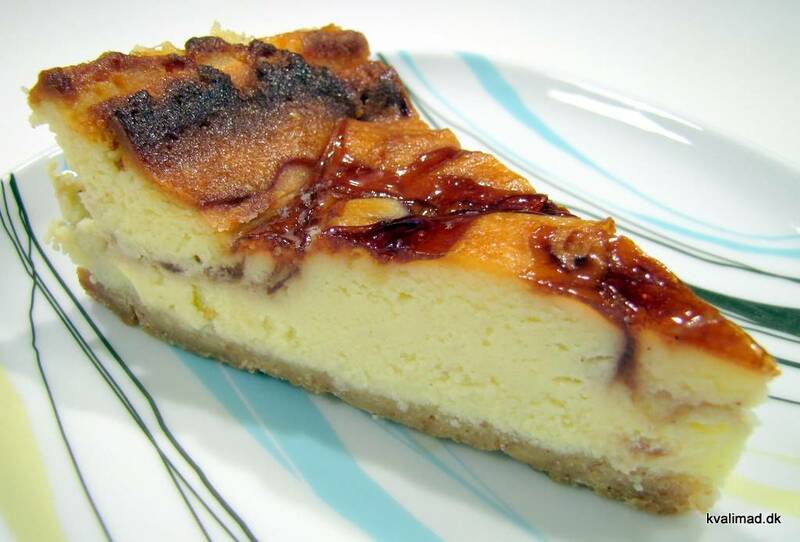 Cheesecake is a variation of a baked cream . The slightly acidic cheese is important for the taste of the cake. Without it, it tastes like it just like a giant creme brulee.